Hair loss is a normal and ongoing process for all people. But for most of us, hair replacement and regrowth makes up for the continuing loss making the cycle unnoticeable. Usually, advancing age tends to increase losses and reduce natural replacement. Aside from these normal hair loss factors, there are some cases where individuals lose hair earlier or more rapidly than normal. While the causes of increased hair loss are not completely understood, exaggerated or unusual early hair loss can be associated with any combination of several factors. “Pattern” baldness is the most common type of hair loss in men, but in women as well. It appears differentin men versus women. Women tend to get diffuse thinning across the entire top of the scalp, while men usually develop a receeding hairline and often a “bald spot” at the top of the scalp. The technical term is “androgenetic alopecia,” which reflects the fact that this is caused by combination of hormones (especially “male type” hormones like testosterone), and genetics, the inheritance of a complex group of genes from the parents. .
Technically called “Telogen Effluvium,” this common form of hair loss is triggered by high levels of stress. This can be physical stress—a major surgery, difficult childbirth, or serious illness—but now is often more the result of longstanding mental stress and strain. Known as “Alopecia Areata,” this condition is particularly common in children and adolescents. Round patches of complete hair loss abruptly develop. In some cases it can progress to complete loss of all hair. It is caused by an overactive immune system which mistakenly attacks the hair follicles. 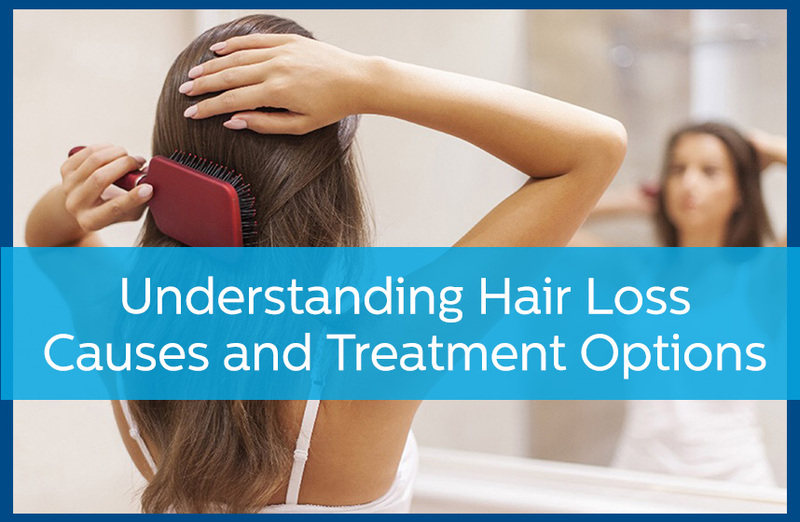 Some internal problems can result in hair loss. Thyroid problems are well known as a cause of hair loss, and iron-deficiency anemia is another often-overlooked cause. A”ringworm” fungal infection can cause a temporary hair loss. More permanent losses can occur from diseases such as lupus, sarcoidosis, and lichen planus, which can lead to scarring and permanent hair loss. Taking too much vitamin A can produce hair loss. So can taking certain medications whose side effects include loss of hair. Certain drugs for birth control, blood pressure control, heart problems, arthritis, depression, and cancer are known to be associated with hair loss. Radiation therapy is well known to cause hair loss. Some types of hair loss are permanent, while others can be temporary or reversible. Treatments include a variety of medications, surgical procedures, as well as hairpieces or wigs. The objectives in treatment involve some combination of the stimulation of hair growth, limiting or reversal of hair loss, or the hiding of hair loss. Hair loss caused by an underlying condition is, of course, dealt with by treating the underlying disease. Some types of inflammatory hair loss, such as alopecia areata, are treated with topical or injected cortisone. Others, like telogen effluvium, may respond to vitamin supplementation. The most common medications for treating pattern baldness are over-the-counter drug, Minoxidil (Rogaine) and prescription drug, Finasteride (Propecia). With both medications you need to keep taking the drug once you begin or the beneficial effects of reduced hair loss and/or regrowth are reversed. Some specific types of hair loss have specific treatments. For example, hypotrichosis—overly thin, short eyelashes—is a common complaint in women. This can be effectively treated withLATISSE®, a prescription treatment for inadequate hair in the eyelashes. The most common surgical restoration involves a transplant procedure where plugs of normal skin with hair are moved from unaffected areas of the scalp to those exhibiting pattern baldness. In some patients, the less invasive approach of laser therapy has proven helpful in improving the hair loss condition and the overall thickness of the hair. High-quality wigs are now available, offering not only the strategic concealment of hair loss, but also the options of a wide selection of hairstyles, lengths, and colors. If you’re concerned about hair loss, schedule an appointment with Avail Dermatology today by calling 770-251-5111 for a consultation. 5 Simple Tips to Keep Dry Skin At Bay This Winter Can Your Dandruff Cause Hair Loss?